CONSUMER ELECTRONICS SHOW (CES)—LAS VEGAS, NV—JANUARY 5, 2006 – NVIDIA Corporation (Nasdaq: NVDA) today introduced three new graphics processing units (GPUs)—the NVIDIA GeForce Go 7800, GeForce Go 7600, and GeForce Go 7400 GPUs—bringing cutting-edge 3D, high-definition, home theatre–quality video and advanced power management to the notebook market. These three additional GeForce Go 7 Series GPUs are included in tier one OEM notebooks launching at or shortly after CES. OEM design wins, based on the newest Intel Centrino mobile platform, include: ASUS, Acer, Gateway, LG, Samsung, SONY, and others. In addition, NVIDIA GeForce Go 7-series GPUs were selected to drive the video and graphics in the first notebook computer to integrate the new HD DVD media standard, the Toshiba Qosmio audio-video notebook PC. Those new notebooks that have been launched will be on display at CES this year, from January 5-8 at the NVIDIA booth, located in booth number 36200 in the South Hall of the Las Vegas Convention Center. Next-generation NVIDIA HD PureVideo™ technology, which lets users experience home theater–quality HD video on the notebook PC—key to the exciting new HD-DVD and Blu-Ray HD formats. The GeForce Go 7800 delivers enthusiast-level graphics and video performance for slimmer notebooks with significantly reduced power. The GeForce Go 7600 provides the perfect balance of graphics and video performance for slim multimedia notebooks. 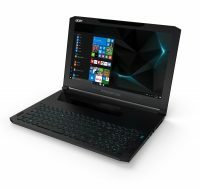 The GeForce Go 7400 creates the no-compromise mobile notebook, a small, thin, highly portable notebook, equipped with the latest graphics and high-definition video support.